Moving & Storage & Delivery Ltd.
A.C. Moving & Storage & Delivery Ltd. is Mississauga’s premier moving company. We have been satisfying customers for over 20 years, by offering exceptional services to customers throughout the GTA. Our goal is to make your move as simple and stress free as possible, without the usual headaches and hassles involved. We will take care of the entire process, all the way from packing of your belongs to the unpacking of them at your new home. Our staff of qualified movers are experienced as well as customer service oriented. 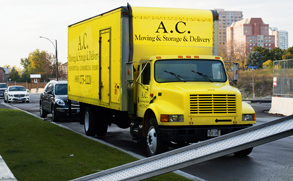 A.C. Moving & Storage & Delivery Ltd. is a professional moving company that has all the logistical, packing and storage capabilities to move your family anywhere in Southern Ontario, including the GTA, Mississauga, Brampton, Burlington, Oakville, Milton, Bolton, Georgetown, Hamilton, Niagara Falls, St. Catherines, Woodbridge and Vaughan. We can move homes of all shapes & sizes. Our bread and butter service. We move your goods from your old home to your new one, with the highest level of customer service and professionalism. We are specialists in moving seniors. We will get you all set up from start to finish. We offer storage in many different sizes and at a more affordable rate than any public storage businesses. The entire team takes extreme pride in providing outstanding customer service, at all times. When you choose A.C. Moving as your mover, we treat you just like a member of the family. We have always been family run and will continue to do so. With A.C. Moving you can rest assured that you're precious belongings will be delivered safely and on a timely manner. We offer competive rates and provide exceptional customer service to all our clients. We have been moving clients for over 20 years. At A.C. Moving we're always trying to make your move as stress free as possible. We find that the customer is alot more relaxed knowing they can get a hold of us 24/7. AC Moving treats your home as their own and we would strongly recommend them. We were in search of movers who provide an in-house moving service to move furniture and appliances between floors in our house in order to complete our home renovations. AC Moving provided a complete in-house moving package by not only doing the heavy lifting of furniture and appliances, but they also disassembled or assembled and packaged the furniture, including specialty items such as our grandfather clock. The team provided a value-added service of expertise, professionalism, friendliness and careful handling of all our furniture. We have used AC Moving services twice already and we will be using them again when we complete the final stage of our home renovations. I would certainly be happy to recommend you at any time. Thank you again. I am writing to thank you for another successful move on Oct.28, 2009. This is the second time you have moved me and once again you did it very quickly, without fuss and without any damage. I certainly appreciated the fact that you were able to move my wall unit without me having to disconnect all the wires. I would never have got them hooked up again!! You are the one of best storage and movers we have ever seen! We just wanted to convey our gratitude and appreciation for the wonderful care you took and work you did during our recent move. Along with Carmelo and Cris, the three of you did not stop working the entire duration of the move, it was terrific to see how seriously the contents of our home were taken and how efficiently the work was completed. As you are aware, we have already forwarded on the name of you company to others with high recommendations. We could not believe the patience you showed in placing items exactly how and where we wanted them. Your professionalism, courteousness and work ethic will no doubt continue to bring much success to your company. We will gladly share our positive and memorable experience with everyone. I would recommend you to anyone, as I had been by my Real Estate Agent, and a personal friend, who both spoke very highly of you. This letter is to express my thanks for your wonderful and professional job in moving me. I had over 150 bankers boxes most of which were heavy and filled with books. I had dishes and mirrors and furniture of which nothing was damaged or broken. What impressed me most was the friendly and cooperative service given by any of your people. I never heard a complaint or bad word from any of them, even if the task was tough. They were always very polite and willing to serve my needs. They asked where I wanted it and did their utmost to put it right. They were well organized, hard working and swift. They had all the right equipment to do a professional job. Their timing was impeccable. Great job guys! Very satisfied! Our household was packed and we had to move into our garage while our home’s floors were being refinished on the main level. Afterwards, our things were brought back inside in good condition. Thank you A.C. I was extremely satisfied with their excellent service and am pleased to highly recommend them. This is an unsolicited letter of reference for A.C. Moving & Storage & Delivery Ltd. who moved my furniture at the end of October, 2006. I was impressed by the cleanliness of the truck and equipment that they used and was very pleased that they were as punctual as they had promised to be. They had also been able to accommodate a change in my moving date which occurred due to unavoidable circumstance. Both Carmelo and Benito were polite, helpful, and organized, as well as careful and did what was necessary to proceed cautiously when required with delicate items. Everything arrived safely and in as good condition as it had left. Also, even though the company charged for the move by the hour, the men did not dawdle but worked diligently and steadily the whole time. A.C. Moving & Storage & Delivery Ltd. is a family owned and operated business. We’ve been moving satisfied clients for over twenty years and we look forward to serving clients for twenty more. We offer exceptional service with competitive rates. COPYRIGHT © 2017 ALL RIGHTS RESERVED A.C. MOVING & STORAGE & DELIVERY LTD.